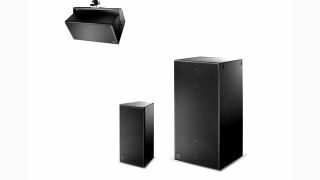 The What: d&b audiotechnik has added the 24S and 24S-D point source loudspeakers to its xS-Series, designed for permanent install applications including nightclubs, live performance venues, and houses of worship, as well as multipurpose centers, and sports venues. Differing only in horizontal dispersion, with 75-degree by 45-degree and 110-degree by 45-degree (h x v) respectively, the 24S and 24S-D house two 12in LF drivers in a dipolar arrangement and a single horn-loaded 1.4-inch exit compression driver. This HF horn is rotatable, meaning the 24S/24S-D can be mounted either vertically or horizontally. By separating the LF drivers, they achieve constant directivity control in the same plane as the dipole down to approximately 500Hz. The result is a powerful single box solution that avoids the transmission of energy into the reverberant field, and increasing gain before feedback when working with open microphones. The 24S and 24S-D have frequency response extending from 55Hz to 18kHz, suited to a variety of full range applications. The new 21S-SUB provides additional low-end support from a small footprint. Housing a single 21-inch driver in a bass-reflex design, the 21S-SUB can be operated in standard mode, to produce a frequency response of 35Hz to 105Hz, or as a supplement to other d&b subwoofers in INFRA mode, extending the LF performance to 33Hz with an upper limit of 85Hz. The Bottom Line: In combination with the installation specific d&b amplifier, 30D, the 24S, 24S-D, and 21S-SUB produce 138dB SPL, 137dB SPL, and 134dB SPL respectively, and serve as an alternative to a small multiple cabinet line array. The flexibility of the system makes it well suited whenever ceiling height and amplifier channel count make a line array inappropriate.